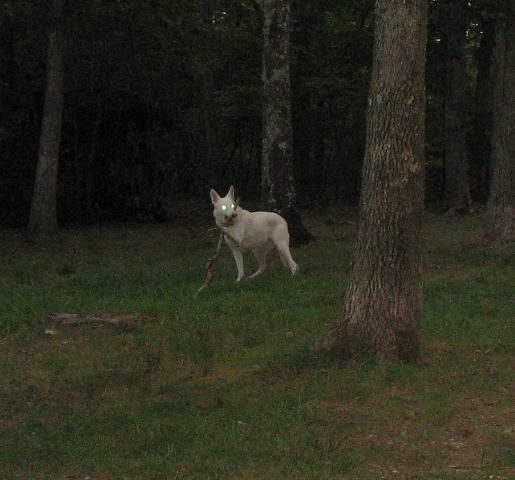 Your White German Shepherd: What Does He See at Night? What does your dog see when he patrols the yard at night, or when you go for an evening walk? Most healthy dogs have keen night vision, far better than their human companions; for your White German Shepherd, this ability is particularly important. German Shepherds, with their sharp intelligence and high work drive are already the dog of choice for protection and law enforcement. The ability to see well in the dark only enhances their utility and allows them to move gracefully and navigate safely long after their human companions can’t see a thing. 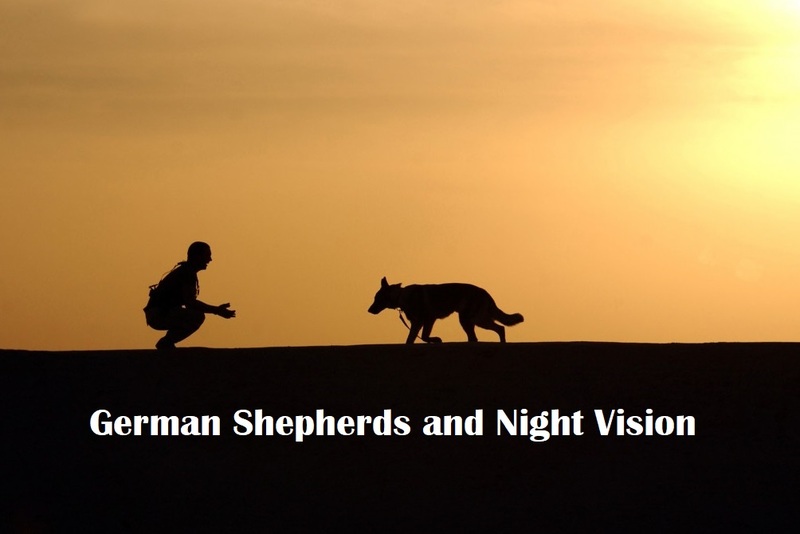 Since these powerful, clever dogs are motivated to look after their homes and families, night vision is an asset for the White German Shepherd that is a beloved family pet as well. It is not unusual to see one of these fierce protectors do rounds of the yard or home after dark, ensuring every member of the family is safe, secure and where they should be. The ability to see outside at night also helps your German Shepherd protect your home and property and alert you to intruders or danger. A healthy adult German Shepherd has excellent vision during the day, relying on both color and brightness to navigate his environment (more on day vision here). She sees fewer colors than you do during the day; only about half of the rainbow or range of colors that you see yourself. While this may seem like a disadvantage, it becomes a significant asset after dark. The reduced color spectrum available to her allows your White German Shepherd to identify brightness, shapes and movement in very low light. You’ll need a special night vision scope to see as well as she does after dark. Why do Dogs See Better Than Humans at Night? The shape of the eye itself, along with some adaptive evolution, allows dogs to see better than we do once the sun goes down, according to Comparative Ophthalmology professor Paul Miller, of the Veterinary School at the University of Wisconsin-Madison. Dogs have more of the light-sensitive rods than the color-detecting cones. This makes them see fewer colors than a human does during the day but allows them to see in far dimmer light. The wider pupil and increased number or rods gives your pet a significant night vision advantage – but that’s not the only thing that is helping him see so much better than you at night. While the increased number of rods that are present in your White German Shepherd’s retina help, his biggest advantage is in a mirrorlike structure in the back of the eye called the Tapetum Lucidum. 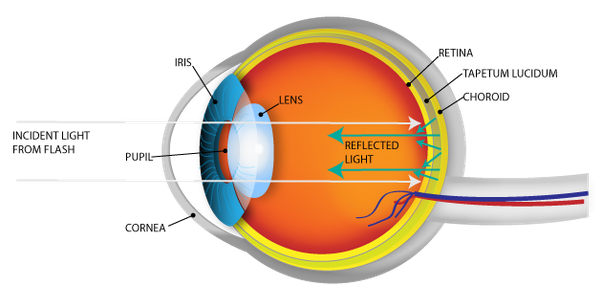 This structure is present in the back of your dog’s eye and helps reflect and bounce light to the retina, increasing her night vision. Since this essential component reflects light, it not only enhances her night vision, it makes her eyes glow in the dark at night. What does this mean for you and your White German Shepherd pup? You’ll have a few advantages during the day – -but you should follow her lead the next time you’re walking down a dark path at night! Come meet the newest members of the family – our new arrivals are just beginning to open their eyes and see the world around them.